JERUSALEM (Reuters) – Israeli President Shimon Peres has thrown his weight behind U.S. plans to arm Syrian rebels, shrugging off fears the weapons could be turned on Israel and exacerbate the conflict. 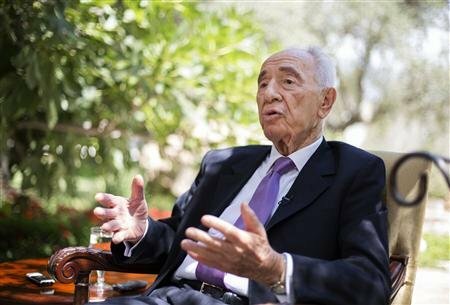 In a wide-ranging interview with Reuters before his 90th birthday, Peres dismissed the idea that Israel could launch a unilateral military strike against Iran’s nuclear facilities and urged Palestinians and Israelis to forge immediate peace. Looking at the many problems besetting the Middle East, Israel’s elder statesmen, who is a Nobel Peace Prize laureate, said terror groups were ripping apart the Arab world. After two years of uncertainty in the face of the Syrian civil war, the United States announced last week it would start to arm rebels seeking to oust Syrian President Bashar al-Assad after concluding his forces had used chemical weapons. Many Israeli politicians have cautioned against giving weapons to the increasingly radicalized rebel fighters, fearful that the arms would sooner or later used against Israel, which shares a tense frontier with its old foe Syria. “They didn’t have a choice,” he added, sitting in the sun-soaked garden of his tranquil Jerusalem residence and speaking in quiet, measured tones. “Unfortunately it is becoming more of a confrontation between two superpowers and (there is) a growing intervention of outside forces … It is a tragedy,” he said. While Russia, Iran and Lebanese guerrilla group Hezbollah have thrown their weight behind Assad, radicalized Islamist groups allied to al Qaeda have increasingly taken over the rebel cause, marginalizing more moderate forces backed by Washington. Peres said all the world’s “unemployed terrorists” were heading to the region, bringing ruin in their wake. Lionized abroad for promoting Middle East peace, Peres is often a lonesome dove in Israel and wields moral authority as president rather than any real political power. Closely associated with the political left, he has sought to avoid friction with the right-wing prime minister, Benjamin Netanyahu. But he has broken ranks over Iran, scoffing at threats from the government to attack Iranian nuclear facilities in an effort to prevent Tehran from building an atomic bomb. “Why should Israel talk about wars and arms? We must understand there are things we cannot do,” Peres said, adding that only the United States could prevent Iran obtaining nuclear weapons. Tehran says its atomic program is peaceful. Peres is due to host an international conference this week, drawing an array of business and political leaders. One man who will not be attending is prominent British scientist Stephen Hawking, who pulled out of the event last month to protest against Israel’s occupation of territory where the Palestinians want to create an independent state. Peres said the boycott was a mistake, but urged his government to find a way to resume peace negotiations with the Palestinians which broke down in 2010 over the issue of continued Jewish settlement building on occupied land. Kerry has warned that the so-called two state solution might evaporate within two years, as Israel forges ahead with its expansion program in the West Bank and East Jerusalem, which are speckled with some 120 authorized settlements and dozens of outposts built by settlers without permission. Ever optimistic, Peres thought the settler problem could be overcome, pointing to ideas outlined in previous negotiations. “They were offered two options. One, the settlers that want to come back (to Israel) should come back and be compensated. There will be three blocs for the ones that want to remain … What will be in the (next) negotiations, we will see in the future,” he said. Peres played a central role in the Oslo Accords, which were signed in 1993 after months of secrecy, laying out the promise of an independent Palestine within five years. He shared a Nobel Peace prize for the deal, but the agreement failed to live up to expectations and is now routinely denounced by numerous Israeli and Palestinian politicians. However, Peres refused to review his career, saying he did not want to become a “poet of regret”. “I don’t look back. It is not interesting. Because what happened is over, unchangeable … I am more interested in what will happen tomorrow. History moves forward,” he said.